GULF SHORES, Ala. (Nov. 14, 2012)-It is with honor that the publishers and editors of ConventionSouth, the national multimedia resource for planning events held in the South, present the city of Raleigh, North Carolina with a 2012 New or Renovated Meeting Site Award for the city category. "ConventionSouth readers are constantly seeking information on the best destinations in the South to hold their meetings and events. This is why we are honored to present Raleigh with a New or Renovated Meeting Site Award," said ConventionSouth Publisher J. Talty O&apos;Connor. "The recent enhancements to Raleigh make it a hot spot for meetings and events." ConventionSouth Executive Editor Marlane Bundock added, "Out of hundreds of meetings destinations in the South, Raleigh is one of four that we are honoring this year along with Greenville, S.C.; Jackson, MS; and Little Rock, Ark. These four destinations have all made major improvements to their downtown sector, providing a new energy where meeting attendees can get a world-class experience in a unique Southern setting." 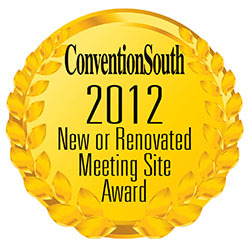 nation as ConventionSouth also presents planners with its annual "Meeting Professionals To Watch"
designation. "Featuring peer advice and trade secrets from our Meeting Professionals to Watch in 2013, our Awards Issue is one of the most popular must-read resources within the meetings industry," O&apos;Connor said, adding that the issue will also feature winners from ConventionSouth&apos;s annual Readers&apos; Choice Awards. Celebrating 30 years as a leading meeting planning resource, ConventionSouth magazine is based in Gulf Shores, Ala., and is distributed to more than 18,000 meeting professionals located across the country who book meetings held within the South, according to O&apos;Connor.